A nearly perfect 1-mile loop with intervals marked off with white lines on the road every 200 meters makes Forest Circle a go to for runners. 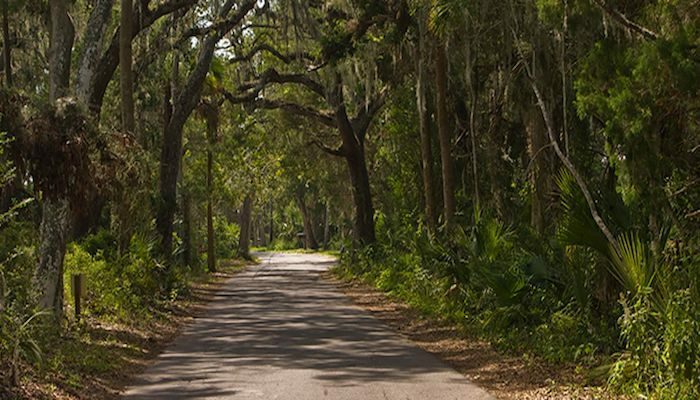 The Mandarin Neighborhood is characterized by its magnificent oak trees hung with dramatic Spanish moss, and it is indeed named after the orange! The area is 11 miles south of downtown. To make this route longer combine it with an out-and-back run on Beauclerc and Scott Mill Roads. These roads attract runners year round because of their great scenery. With large oaks, magnolia trees, and maple trees to shade the way, these two roads offer a very shady and flat course. This neighborhood is also an important part of several of the area’s most popular road races, including the Jacksonville Bank Marathon and the Outback Distance Classic.